It’s 2 a.m. You’re on a mooring in your favorite getaway harbor. The party on the boat three cans down has finally died away. And, you still can’t sleep. Something’s missing. You jump up and dash topside, flashlight in hand, looking over the side and around the anchorage. The dinghy got away! It’s not banging on the side at the end of the painter! That’s what’s missing…. You glance over the transom, and there she is, firmly clipped to the swim step. Not swinging, not banging on the side, not trying to escape. Easy to board, easy to release, and easy to attach and exit. That’s a side benefit of the Forespar Quik Davit. 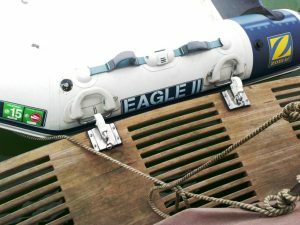 We added the Quik Davit to the swimstep of our Grand Banks so we’d have an easy way to hoist in the dinghy when moving to a new spot, rather than use the the topside power hoist, etc. It works perfectly as the name implies, and as our private, mobile dinghy dock. Friends use the Quik Davit on a variety of smaller and larger power boats as the primary davit because it’s easier to inflate the dinghy at the home dock, hoist/tilt it onto the step, and drive away – and reverse the process when back at the home dock. Sailboat owners do the same, usually for shorter cruises, and for the above-mentioned reason. Check Quik Davit out. It installs easily on both the dinghy and the step of just about any boat, is easy to use, the price is right – And you’ll sleep better. Mike Dwight January 4, 2018 Category: Forespar Products in Use, Uncategorized. Tagged: Davit, dinght davot Quik Davit, dinghy, Quik Davit.